Helping critically ill, traumatized, abused, grieving, and other children in crisis and their familiesRead about my efforts to help all the kids who need courage and how I help make it happen! Duffy likes to travel with first-responders to be on site to help a child in need from the very beginning. The Courage Lion was developed in a joint effort with the Johns Hopkins Children’s Center, Child Life Department to help children as they experience illness, trauma, abuse and other crisis. The acclaimed international Courage Lion Program is dedicated to critically ill, traumatized and abused children in treatment/medical facilities throughout the United States and Canada and has grown since 2006 to 136 hospitals, medical facilities, hospices, military commands, camps and more. 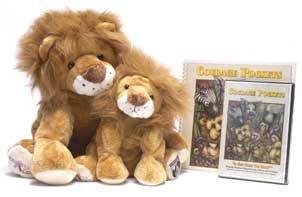 Each Courage Lion comes with the book “Courage Pockets”, which introduces the story of a young lion, Duffy, who faces the challenge of recovering from an injury. In reading about Duffy’s feelings and experiences, children have the opportunity to identify and communicate about their own feelings and situations. When read with a parent or other adult, the book offers valuable opportunities for children and caregivers to identify and validate feelings, concerns and coping strategies, expand self-awareness, and encourage sharing and discussion. Also, children are able to merely enjoy the book as a story that need not be analyzed. In essence, children can take from the story only what they are ready to find. 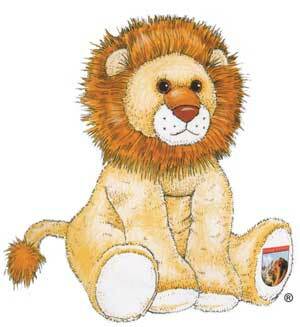 Duffy is a cuddly therapeutic animal used to enhance communication, while reducing anxiety and fear. Duffy’s arms have been lengthened so that they can point to any part of the body that hurts, can be folded to express how the child feels and is able to be positioned on beds, chairs, IV poles etc..
On the chest is a courage pocket that enables Duffy to be used as a transitional aid to take on the worries of the child, as well as, a boasting pocket for a variety of successes. The pocket contains an embroidered heart and an attached mock river stone that is a lead into the associated book “Courage Pockets”. Courage Roars from Sheffield Audio/Video Production on Vimeo.